MASSACHUSETTS: Long Lines As Legal Pot Sales Start - Joe.My.God. 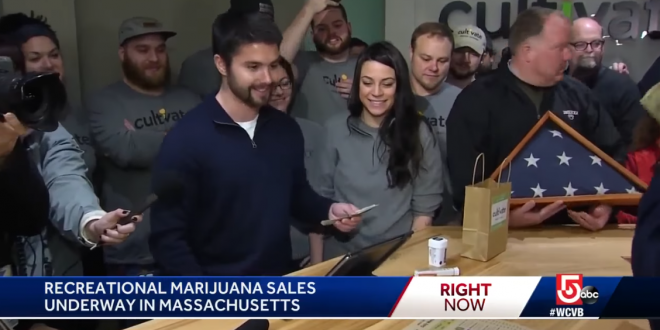 Hundreds of customers hoping to purchase marijuana on the first day of recreational sales in Massachusetts were waiting for hours in long lines Tuesday, despite the cold temperatures and rainy, overcast weather. At the New England Treatment Access shop in Northampton, the wait time as of 11 a.m. appeared to be around two and a half hours. Hundreds — possibly even a thousand — customers were queuing up as of early Tuesday afternoon. NETA officials said they expect a line all day long and another rush after work hours, but they warned that people who show up around 8:30 p.m. might not get to the front of the line before the store closes at 10 p.m. The mayor of Northampton, Massachusetts was first in line to legally purchase marijuana at one of the town’s new dispensaries. “I think there’s a lot going on here in trying to bring marijuana out of the shadows,” Mayor David Narkewicz said.